My first pair of 'Raw Selvedge Denim' jeans. For those that are new to this style of denim: Raw - means they have been dipped in indigo but not yet washed so there is no fades, distress marks etc. Selvedge denim is denim that has been spun on old style looms making the jeans extremely durable and hard wearing - the best quality jeans you can buy. The jeans start off as an extremely stiff canvas and by breaking them in over time you create your own fades and distress marks relative to your lifestyle. Therefore creating a completely unique pair of denim personal to you. The Petit Standard is A.P.C's slimmest fitting pair of jeans, Made of 100% cotton and featuring a low rise; these jeans are by no means skinny but do have a tapered leg. I would most definitely recommend sizing down 2 inches from the your normal waist size as these jeans will stretch out to your normal size. I personally sized down 3 inches as I prefer my jeans skinny and when first wearing the jeans I couldn't do up the top button but now they have stretched out to a very comfortable and more fitted pair of selvedge denim. A.P.C advise not washing your jeans until 6months of wear. The longer you leave it and the more you break the denim in the better effect of fading you will have when you come to washing them. In terms of maintaining hygiene without washing the denim people recommend turning the jeans inside out and placing them in the fridge freezer to kill any bacterial, or airing them if they get a bit smelly. When finally coming to wash the denim, it is advised to first get them dry cleaned and then soaking them in water with Woolite Dark detergent to hold the colour of the denim. Petit Standard raw denim comes with a long leg as standard that can be altered to your own height but however is recommended to be done after your first wash as the size will change. The long leg? You've got two options: 1. Roll them up and show off that famous red 'self-edge' interior strip that binds the denim together. 2. Let them stack up nicely above your shoes. If your tall however.. consider yourself blessed. 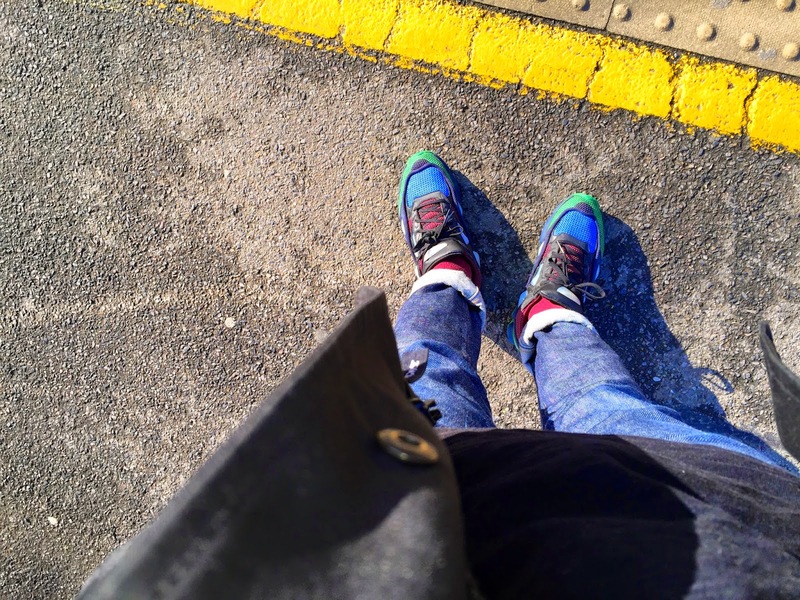 Being massively in to skinny jeans getting out of the routine was hard and I hated it at the start. Partially due to buying my usual waist size with my first pair, when they stretched out I felt like I was drowning in them, so cut them into shorts and started again with a fresh pair 3 inches smaller. These are now an essential pair of jeans in my denim rotation. After 6 months I am still yet to wash them.. (don't worry I still smell fresh) and the fades are coming along very nicely (featured above). I will post an update when I've finally washed them. A great hard wearing pair of jeans essential in any man's wardrobe. Minimal Parisian chic from A.P.C. Acne's first ready-to-wear item was a pair of raw jeans. The brand is now incredibly popular. Getting such a good reputation in the industry must mean one thing; these guys know how to make good denim. Ace: Acne's skinniest cut of jeans, mid rise, good length, a very tapered hem and to make things easier: they fit true to size. The Cash colour way comes over dyed black and is the perfect black skinny jean. The denim does however have 2% Elastane to 98% Cotton, a good mix to add a bit of stretch to these very well fitted jeans. The jeans are made to fade, after the first wash they will tend to go a washed out black/grey colour; which actually came out really nice after my first wash (featured above). If your looking to keep them black I would recommend getting them dry cleaned or washing them very infrequently - in all honesty I would recommend doing this for all denim to maintain longevity of the garment, regardless some colour loss is inevitable. Only negative I can possibly think of is when the dark black coating faded, I also lost the stiffness of the denim leaving them feeling slightly thin and cheap. Acne Ace, a great fit and Cash a great wash both before and after fading, the quality isn't completely there but a lovely pair of jeans none the less. Hedi Slimane produced great denim when he was at Dior; Nothing changed when he moved to Saint Laurent! 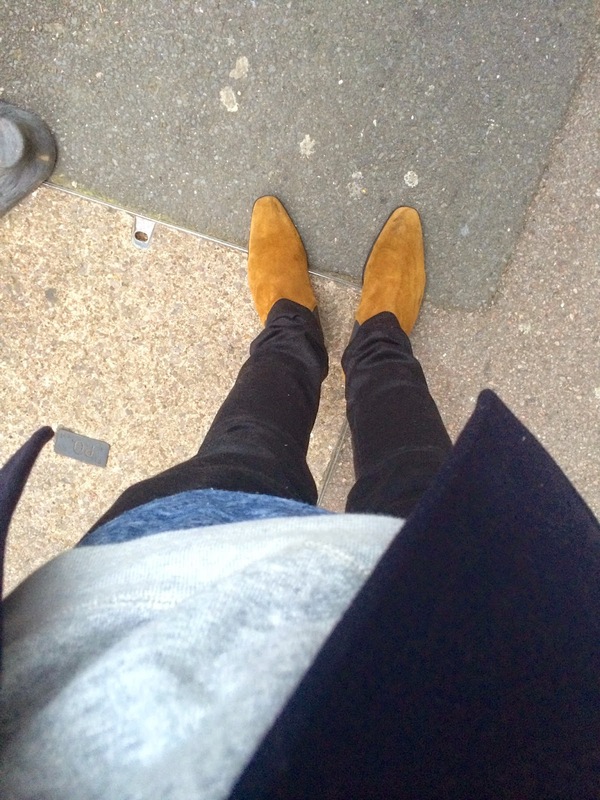 My first pair of SLP jeans made me go crazy for the fashion house. These jeans are a firm favourite in my collection, I'm sorry Acne but these are the best black skinny jeans to ever be made! Featuring a skinny 15.5cm hem allows the Japanese denim to stack lovely on top of a pair of sneakers or as Hedi showcased across his shows go for the rock'n'roll aesthetic with a pair of Chelsea boots. The jeans are made up of 95% cotton and 5% polyurethane which is a combination I have never seen before, the jeans are as stretchy as denim with elastane but maintain a rough rigid feel and lose little to no shape with no colour loss. Polyurethane > Elastane. The perfect skinny jean. Hedi God. After my love for the quality and fit on the D02 SLP Jeans I had to get the lovely light blue washed skinny jeans for summer. They fit just as nicely as the black jeans but for warmer months the denim wasn't as heavy, made in Italy and mixed with 1% elastane these jeans are the perfect light wash skinnies. Slight loss of shape due to the elastane but by no means comparable to other brands on the market. 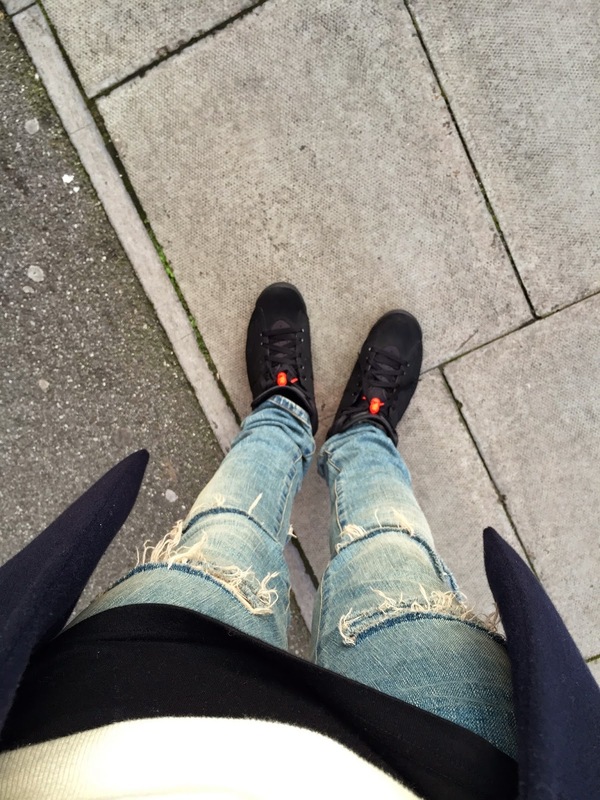 Great denim from SLP once again. SLP destroyed blue denim. I've never been so obsessed with anything in my life, which is pretty damn worrying. I missed out on the AW13, the SS14 and then AW14 versions of the destroyed jeans; they sold out - and for one reason Hedi and SLP make the best ripped/distressed/destroyed/crash (whatever you wish to call them) jeans, period. 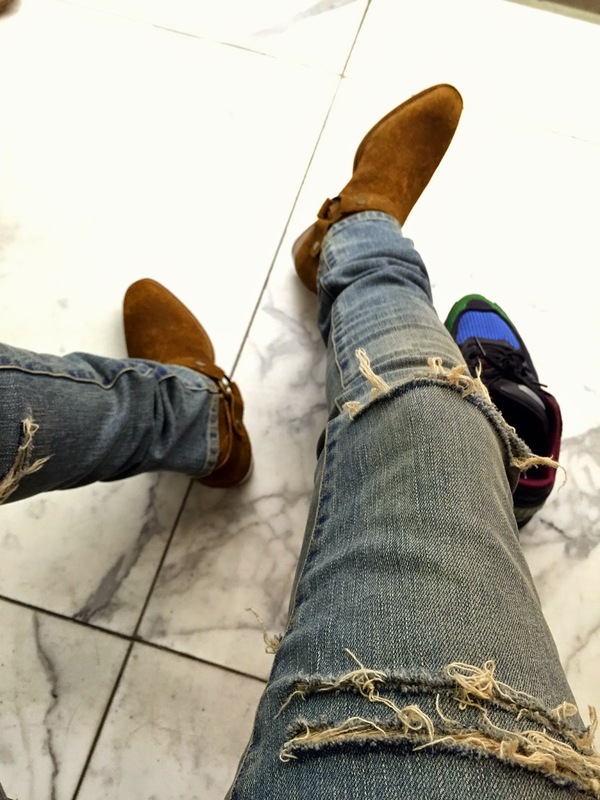 Distressing jeans yourself, I rate the custom 1 of 1 feel but you cant rip jeans like Hedi does. So when the SS15 versions released I didn't even have time to hesitate. Being such an overpriced pair of jeans it was hard to part with the cash but they are sign of incredible craftsmanship. The SS15 versions were however slightly less intricate and featuring rips on the back of the denim which I was originally unsure about but the amount of compliments I've had on these is ridiculous, and I've since fell in love with these jeans. To summarise, if you are willing to part with the cash. SLP Jeans are the best in my opinion, quality, cut, washes and I guarantee will last you a life time with the right care. Be sure to check back to see how these jeans all fit. 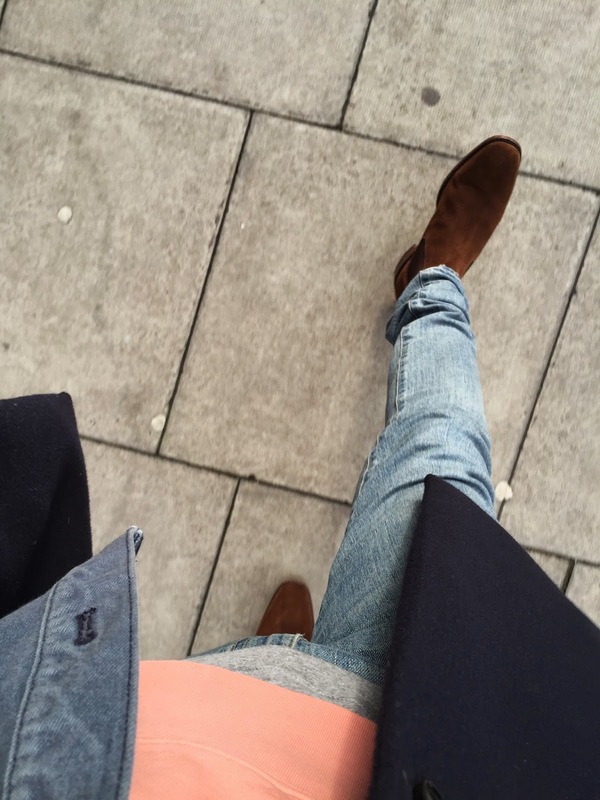 Nice post, I have a pair of light blue D02's and was wondering if there is anything I can do to preserve the color so the jeans don't turn into white jeans. LOL Haven't washed the jeans since I got them 4 months ago.